An assistant professor in the new Department of Occupational Therapy continues groundbreaking work for young adults with autism and their future co-workers. Jeanne Eicher is featured in the short video “Engineering Brighter Futures for Autism” that was released late last year. The annual event engages participants to use teamwork and focused thinking to design and build devices. At the 2018 event, students working in small groups set out to digitally design plastic versions of internal combustion engines. They then manufactured the parts with three-dimensional printers. Last, they tested them to see if they ran. Each team had young adults on the autism spectrum as well as neurotypical volunteers from the community to simulate real-life work situations. 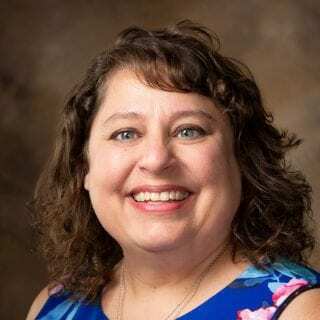 Eichler earned a Doctor of Education from Saint Louis University, a Master of Occupational Therapy from the University of Saint Augustine for Health Sciences and a Bachelor of Music Therapy from Loyola University New Orleans. “Jeanne’s amazing work deserves to be highlighted,” said associate professor Sherry Muir, director of the Occupational Therapy Department. The Engineering Brighter Futures program was initiated by Eichler and Arif Malik, now an associate professor of mechanical engineering at UT Dallas, when both taught at St. Louis University. “Our goal is to continue developing the program curriculum and research here in Arkansas with partnerships with UT Dallas and additional corporate partners. I am currently looking for collaborators and funding to make this happen,” she said. Eichler is to present the Engineering Brighter Futures project at the annual conference of the American Occupational Therapy Association in April. She is to help run this year’s Engineering Brighter Futures for Autism event in Dallas later that month with UT Dallas and collaborators Microsoft, Autism Treatment Center-Dallas, and Autism Speaks. April is Autism Awareness Month. About the Department of Occupational Therapy: The Occupational Therapy Doctorate Program is a graduate-level curriculum offered jointly by the College of Education and Health Professions of the University of Arkansas and the College of Health Professions of the University of Arkansas for Medical Sciences and UAMS’s Northwest campus in Fayetteville. The inaugural occupational therapy cohort is scheduled to begin in January 2020.